What makes the Best Commercial Printing company in Texas? Looking for commercial printing in Texas? Whether you are looking in Austin, Dallas, Fort Worth, Waco, Bryan, College Station or Houston, Integ is just a short drive away. Integ strives to offer the top customer services by responding quickly, asking questions to anticipate challenges before they arise and communicating with clients. Integ’s press strength is unmatched whether you have a large quantity or need small runs, the lineup of offset presses and digital presses can take on your project needs. Our pressmen are a craftsman. Including over a combination of 50 years experience in the offset and digital print industry, their passion for creating beautiful pieces and paying attention to detail, also make Integ one of a kind. Craftsmen continue to learn and grow with each new press, offering solutions to meet the needs of our customers. Quality is found in this aspect and Integ continues to invest in craftsmanship and creating each piece to represent exactly our client’s needs. Integ’s delivery system spans from Houston to Austin and Dallas, Fort Worth. The Integ Delivery Team becomes a recognizable face that delivers your projects safely and on time. Every time. Integ is known for integrity and integration. Integrity based on character and what Integ strives for clients to feel from each interaction. Integration is the process of acquiring more technology and finding a way to offer what clients need. 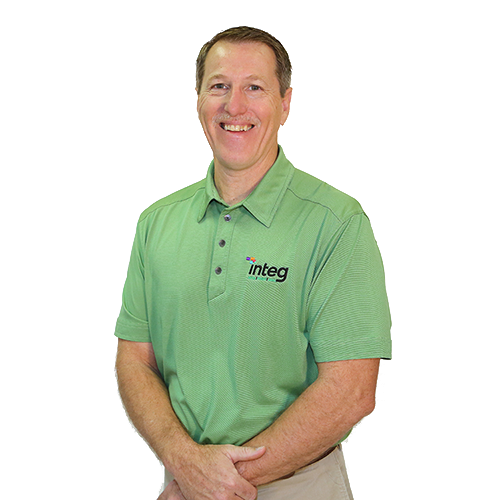 Integ continues to focus on growth and expansion to continue to provide the best services to our customers. Integ Does More than just print. The Integ Solution includes Print, Promotional products and wearables, mailing and fulfillment for outsourcing mailing services, transactional and statement printing, invoice printing, environmental graphics like posters, banners, wall graphics, murals and more. Looking for a quote on your next project or just want more information? Contact us today!